Persons who work or visit downtown Woodbury these days may hear a loud thumping sound. The noise is created by the machine above, which is being used to break up concrete, asphalt and dirt so that new drainage can be installed. The law of unintended consequences came into play during work Thursday on the Cannon County Courthouse Revitalization project. While in the process of digging a trench, a line which runs water into the courthouse was accidentally severed, cutting off water to the building for a time. 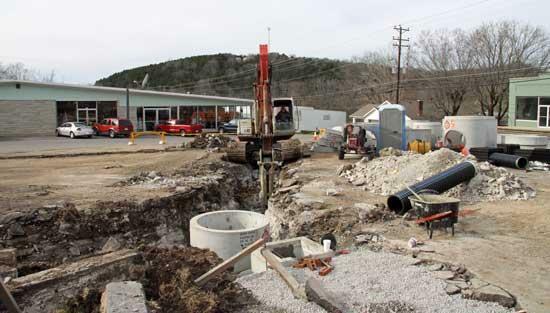 Woodbury Public Works employees, under the leadership of Director Alan Pascal, worked feverishly to install a new line so that water service could be restored. The revitalization project is in its third week of construction. Cannon County Executive Mike Gannon says, please be patient with the work going on around the square and remember that all the businesses on the square are open and doing business as usual. The revitalization of the square should take around 4 months to complete. You B my HERO Mr. Paschal!!! !